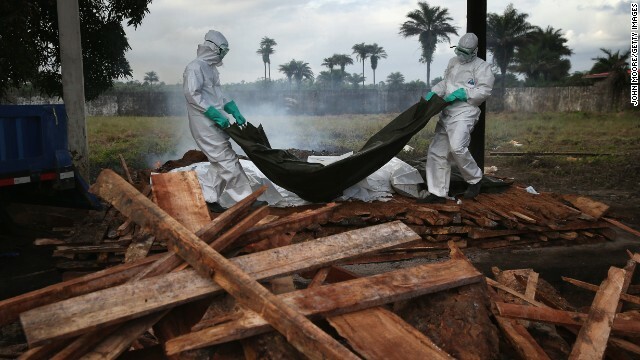 The following is a first hand account of what is happening on the ground of the Ebola outbreak from a nurse Anja Wolz of the Médecins sans Frontières (MSF) yesterday working in Kailahun in Sierre Leone, West Africa. More than 2,400 people have been infected by the virus, according to the World Health Organization, and it’s killed more than half. The center has two sections: the low-risk area, containing the pharmacy, dressing rooms, laundry, laboratory, water-chlorination points, and staff meeting area; and the high-risk, or isolation, area, where patients are admitted and staff must wear the full PPE. Our medical and water-sanitation teams go into the high-risk area with a clear plan: check vital signs, administer medication, serve meals, and clean the 10 tents. There are also teams that help new patients settle in, prepare patients for discharge, and disinfect and remove the dead. Everyone working in the isolation area must follow the protocols and procedures to the letter. We use a buddy system — we’re responsible for ourselves but must also put our lives in the hands of colleagues: one mistake could be deadly. The isolation area is divided into separate tents for patients with suspected, probable, and confirmed Ebola virus. Suspected cases are defined by fever and three or more other symptoms of the disease; probable cases, by symptoms plus known contact with someone who’s had Ebola or with the body of someone who’s died of the disease. There is a clear separation between the tents for these two types of patients, who are given instructions for minimizing the risk of cross-contamination — by washing their hands, for instance, and not touching other patients or their belongings. For the same reason, the staff follows a strict circuit, moving from the suspected-case tents to the probable-case tents and finally to the confirmed-case tents. The isolation area also contains a waste area, laundry, latrines, showers, and the morgue. The staff works in three shifts a day, around the clock, but everything is organized to minimize the time we spend in the high-risk area. In reality, it’s one of the safest places to be during this outbreak, because we know that the patients have Ebola, so every protective measure is in place. In the suspected-case tents, most patients look quite well, but the probable-case area is a different story. Patients here have fever, pain, anorexia — but these symptoms could indicate malaria. In the on-site laboratory, a polymerase-chain-reaction test can determine whether a patient has Ebola, usually providing results on the same day or the next day. When the result comes in, the patient is either moved to the confirmed-case tents or discharged. Knowing what it means to be moved to these tents, patients are understandably frightened. We have a psychologist, a counselor, and health promoters to help and support patients, but there are just too many of them. It’s the children who distress me most. In the confirmed-case tents, I cared for a 6-year-old boy and his 3-year-old sister. Their parents and grandmother had died from Ebola. A midwife in their village then took care of the children, but they began to show symptoms of Ebola and were sent to us. Sadly, they came too late. When the boy died, we tried to console and calm his sister, but the PPE made it difficult to touch her, to hold her, even to speak with her. She died the next day. The midwife who had taken care of them also ended up at our center, and she, too, died. Another patient told me he doesn’t remember how many members of his family have died — he thinks about 13. All he knows is that he is now alone. For caregivers, there is a sad frustration in seeing patients arrive too late — and in knowing that many sick people are hiding, fearing the effects of a diagnosis of this stigmatized disease. Although community health care workers have received training, some of them still don’t recognize Ebola. But we are sometimes fortunate. Today we can discharge four patients who survived Ebola. The discharge criteria call for a negative blood test and 3 days without symptoms. People who have recovered from Ebola are immune from the strain of the virus that infected them. Discharging a patient is our happiest moment — we gather outside the center, clapping and dancing in a celebration that motivates us to keep going. And motivation is important, because today we also received eight new admissions. The new patients sometimes arrive eight to an ambulance, those with suspected cases and those with probable cases all mixed together. We’ve given the ambulance drivers basic PPE to distribute to patients, but they’re afraid to get close enough to hand it out. One day, a surveillance officer from the Ministry of Health is admitted to the center. He was one of the few people who had come from Freetown, the capital city, to help in Kailahun, joining the surveillance team to assess new patients and deaths. He told me he’d come because the people here are his community, his friends, his colleagues. We laughed together, commiserated with one another, and then he was admitted to our center and, sadly, later died. The Ebola outbreak has been out of control for months, but the global health community has taken a long time to react. All organizations have limits, and here in Kailahun, MSF’s limit is in case management. The current international Ebola response remains dangerously inadequate. Last week, 250 contacts of infected persons were identified for contact tracing, but given the number of confirmed cases, there should have been more than 1500. The alert system — whereby an investigation team (and, if needed, an ambulance) is sent to a village when a suspected case or death is reported — is not functioning properly, and the Ministry of Health has only four ambulances in a district with about 470,000 people. Our health promotion teams are still visiting villages where no other health care provider has been. Every day sees deaths in the community that are surely caused by Ebola, but they are not counted by the Ministry of Health because the cause has not been confirmed by laboratory testing. The epidemiologic surveillance system is nonfunctional. We need to define the chains of Ebola transmission to interrupt them, but we lack key data. My time in Kailahun has been frustrating and disappointing, because I know from previous outbreaks what is required to control this one. 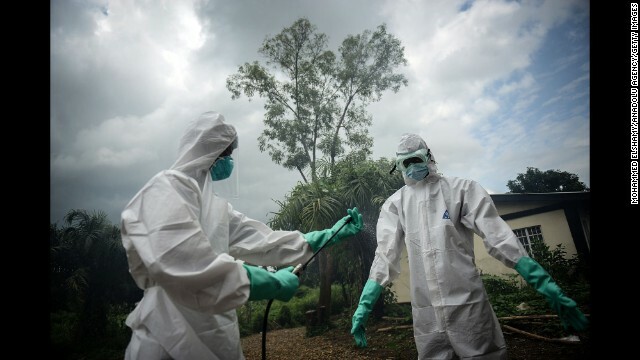 No single organization has the capacity to manage all that is needed to stop the outbreak. Other organizations must attack this outbreak in all its facets. But the response has been too slow. We need people who are hands-on and on the ground. We need to be one step ahead of this outbreak, but right now we are five steps behind.